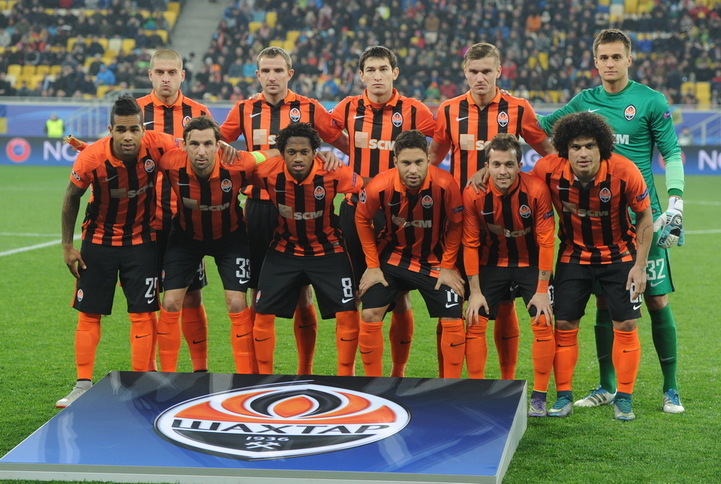 On November 3, Shakhtar faced Malmo at the Champions League group stage. Shakhtar had a task of beating Malmo by a 2-goal margin to have an upper hand over the opponents at the final stage of the competition group stage in case of the equal number of points. Compared to the first match, there were two changes to the Pitmen’s squad: goalkeeper Anton Kanibolotskyy played his debut match in the career, and Azevedo was operating at left back. Ahead of the game, the teams played games in their domestic league. Shakhtar beat Zorya 7-1 in Zaporizhzhya, and Malmo suffered a 2-0 home defeat against Norkkoping to lose chances to win the league title; they finished fifth. As soon as the game started, the Pitmen got off to a flying start in the attacking third and as early as in the first minute they could have opened the scoring: Bernard bore down on goal but sent the ball wide of the goalkeeper. On 7 minutes, Oleksandr Gladkyy flicked the ball on to Marlos, who tried to curl the ball towards the far corner - the ball flew wide. A 3-minute pause followed, when Malmo’s player Levitsky got seriously injured – the visitors were forced to make a substitution. The game slowed down a little, but on 22 minutes Kanibolotskyy had to do his best to stop a dangerous shot from outside the penalty area. Soon the Pitmen scored but the goal was not counted: Bernard seized on the rebound from offside position, when the goalkeeper parried away a powerful shot from Taras Stepanenko. However, on 29 minutes, Azevedo challenged for the ball on 29 minutes on the left side before making a great pass into the penalty area for Gladkyy: the opposition goalkeeper saved a headed shot but the forward seized on the rebound to struck a shot from close range to make it 1-0. Soon Alex Teixeira skipped past two defenders in the penalty area, made a run down the flank before drilling a cross but none of team-mates got on the end of it. In the closing stages of the first half, Teixeira took a powerful shot from outside the penalty area – the ball whistled near the goal post. Alex took a headed shot towards under the roof of the net – the goalkeeper had to work hard to turn the ball away for a corner. In the subsequent attack the Brazilian players tried to slot in from the right, but missed the target. The teams went into the half time break with the Pitmen enjoying a 1-0 lead. In the next episode Gladkyy again took a headed shot following a cross from the left – straight into the goalkeeper’s hands. As soon as the game started, Teixeira was brought down inside Malmo’s penalty area, and Darijo Srna doubled the lead, though the goalkeeper parried the ball away. On 55 minutes, Eduardo, who replaced Gladkyy at half time, got on the score sheet: Bernard volleyed the ball goal wards for Eduardo to direct the ball into the net with his head to make it 3-0. Shakhtar totally dominated proceedings, and a yellow card to Srna after falling inside the opposition penalty area will not allow the captain to take part in the next match due to suspension. On 73 minutes, Srna intercepted the ball on the flank, came inside the penalty area before feeding onrushing Taison – the goalkeeper parried the ball away only for Teixeira head the ball in to make it 4-0 on the rebound. The Pitmen did not stop attacking and had chances to extend their lead. In the end of the game, Oleskandr Kucher received yellow card in the opposition penalty area – he will miss the next match due to suspension. The Swedish team were reduced to ten men after the red card to Arnason. Having claimed a big 4-0 win, Shakhtar took their first points at the group stage to climb up to third place. The Pitmen will play their next match on 25 November in Lviv against Real Madrid.